As the rising sun struggles to shine through the foggy atmosphere of your steampunk reality, you crawl out of bed and begin to prepare for the day. You throw on a newly geared-up top hat with your favorite pair of goggles wrapped around it, along with an awesome pair of fingerless elbow length gloves, and, of course, the best pair of knee-high black leather boots in your closet and you are accessorized to the max... or so you think! 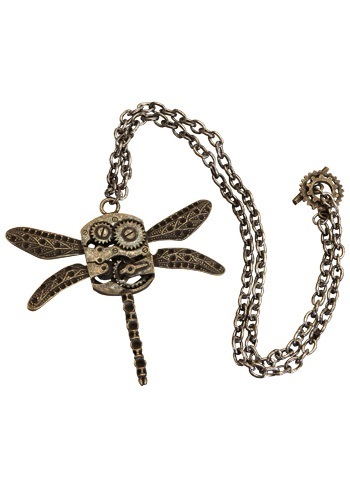 Make sure not to leave the house without this Antique Dragonfly Necklace! It will add the biggest touch of authenticity to your steampunk styled outfit! Hoards of people will crowd all around you to inquire about your unique antique and how you happened to obtain such an exquisite relic. Offer them a tale of a grand adventure through the sky to a distant land. One where nature and technology live and grow together in harmony. You're bound to leave everyone in astonishment with this accessory and its origin story.